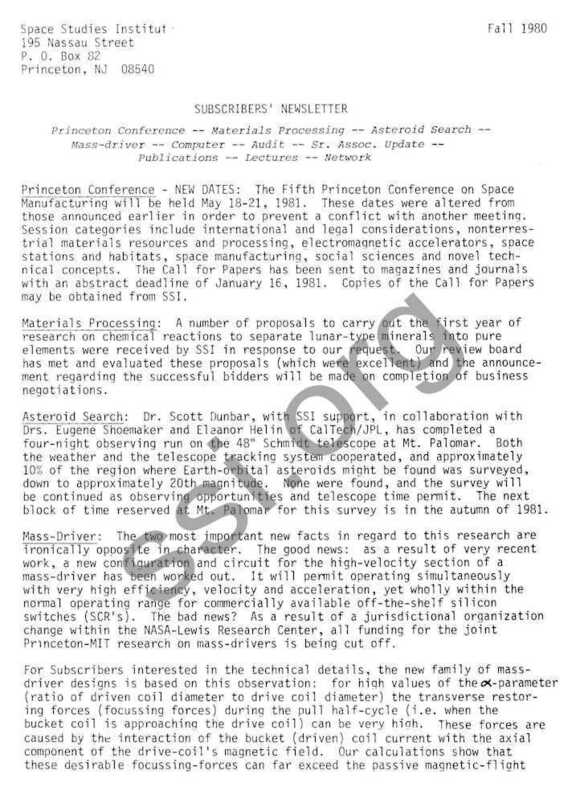 Princeton Conference -NEW DATES: The Fifth Princeton Conference on Space Manufacturing will be held May 18-21, 1981. These dates were altered from those announced earlier in order to prevent a conflict with another meeting. Session categories include international and legal considerations, nonterres­trial materials resources and processing, electromagnetic accelerators, space stations and habitats, space manufacturing, social sciences and novel tech­nical concepts. The Call for Papers has been sent to magazines and journals with an abstract deadline of January 16, 1981. Copies of the Call for Papers may be obtained from SSI. Asteroid Search: Dr. Scott Dunbar, with SSI support, in collaboration with Ors. Eugene Shoemaker and Eleanor Helin of CalTech/JPL, has completed a four-night observing run on the 4811 Schmidt telescope at Mt. Palomar. Both the weather and the telescope tracking system cooperated, and approximately 10% of the region where Earth-orbital asteroids might be found was surveyed, down to approximately 20th magnitude. None were found, and the survey will be continued as observing opportunities and telescope time permit. The next block of time reserved at Mt. Palomar for this survey is in the autumn of 1981. Mass-Driver: The two most important new facts in regard to this research are ironically opposite in character. The good news: as a result of very recent work, a new configuration and circuit for the high-velocity section of a mass-driver has been worked out. It will permit operating simultaneously with very high efficiency, velocity and acceleration, yet wholly within the normal operating range for commercially available off-the-shelf silicon switches (SCR’s). The bad news? As a result of a jurisdictional organization change within the NASA-Lewis Research Center, all funding for the joint Princeton-MIT research on mass-drivers is being cut off. For Subscribers interested in the technical details. the new family of mass­ driver designs is based on this observation: for high values of the ∝-parameter (ratio of driven coil diameter to drive coil diameter) the transverse restor­ing forces (focusing forces) during the pull half-cycle (i.e. when the bucket coil is approaching the drive coil) can be very high. 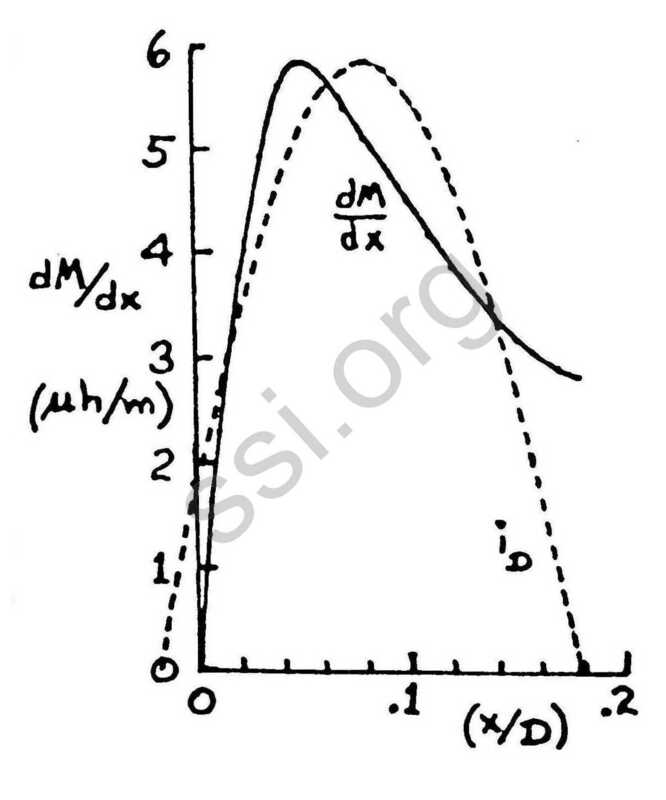 These forces are caused by the interaction of the bucket (driven) coil current with the axial component of the drive-coil s magnetic field. Our calculations show that these desirable focusing-forces can far exceed the passive magnetic-flight forces produced by guide strips. In the new design (see graph) the diameter of the drive coils is chosen relatively large, typically 40 cm (16 inches). The ∝-parameter is about 0.9 and there are no guide strips. Their absence allows tighter coupling (more efficient drive) and also eliminates the partial reduction in drive that their screening in­troduces into “conventional” designs. The drive-coil current rises and falls in a long, relatively slow half-cycle, which remains within SCR limits for current rate-of-change. The number of phases in the drive circuit is set by the requirement that no forward voltage be reapplied to an SCR until its re­quirement for turnoff time is satisfied. Calculation indicates that the new design can easily reach accelerations of the order of 1000 g’s up to velocities in excess of 10,000 m/sec (about 6 miles per second) with high efficiency . A first report on the new work was made at a November AIAA meeting on Electromagnetic Propulsion. 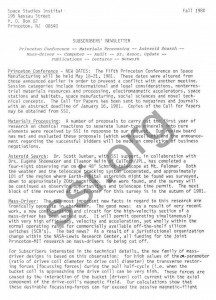 A complete paper on the subject will be submitted to the Fifth Princeton Conference on Space Manufacturing in May 1981. As the funding cutoff for this work was without rational justification, we are exploring a number of possible alternative funding sources for the research within NASA and other agencies. Fortunately we had underspent grant funds, so on a no-cost extension can run without additional funding until April 1981. Only if all governmental sources for mass-driver support fail will SSI be requested to consider assuming the burden of continuing the research. We consider the mass-driver work to be of very high priority and will keep Subscribers well briefed on the negotiations during the next few months. Computer: One of SSI’s supporters has kindly enabled the Institute to purchase a computer system. It is made up of an IBM Series One processor with 128Kbyte fast memory, a 13 Megabyte Winchester-type hard disk, a Diablo printer and extensive word-processing capability, all located at the SSI office. As a remote terminal and smaller stand-alone computer, the system also has an Apple II Plus processor. When the Series One is up and running, we expect to be able to process the records and mailings for our growing number of Subscri­bers more quickly, at less cost in people-hours. That will also permit our initiating a deliberate search for new Subscribers, which has until now been held in abeyance in order to prevent saturating our records-processing staff. Audit: The completion of the 1979 audited financial statement for SSI allows the initiation of a corporate fund-raising drive that has been in careful preparation during the year. Senior Associates Update: The Senior Associate program now has over 350 participants. The ongoing commitment represented by this support enables the Institute to plan research in a coherent way. We are grateful and pleased that the pledge confirmation rate, as detennined by our auditors, is close to 100%. For further information about becoming a Senior Associate, feel free to call SSI. Publications: An article entitled “New Routes to Manufacturing in Space” was published in the October issue of Astronautics &Aeronautics under SSI copyright. The article summarizes two years of SSI-sponsored workshops on a low-cost approach to space manufacturing. The new approach is based on par­tially-automated, partially self-replicating systems. The building-blocks in these systems are small, standardized, modular chemical-processing plants, mass~drivers and general-purpose fabrication shops. The article concludes that a rapidly-growing industry in space can be initiated for a total investment cost of $6 to $8 billion, including all research and development and the necessary Space Shuttle flights (approximately 30 flights). The estimated doubling-time for the capability (tons per hour of output) of the system is 90 days, leading to a capability of more than 100,000 tons per year in less than three years from the initial installation. Key results of the article have been announced in earlier issues of this Newsletter. An article largely concerned with our work is scheduled for the January 1981 issue of TWA Ambassador magazine. A Personal Note: Both O’Neills, Tasha and I, are particularly pleased to report the arrival of a third, Edward Christopher, on August 21st. Since this Fall Newsletter is the last to be mailed before the holiday season, it is our great pleasure to report to you who make the work of SSI possible that the Institute is in excellent condition, and to wish you, on behalf of the staff, the best and happiest New Year in 1981. The New York Section of AIAA has an active agenda for the year. Bill Good has arranged weekly luncheons at the Wings Club (Biltmore Hotel, 43rd and Madison, NYC). Every Wednesday, a guest speaker will address Section members on a variety of topics related to the program’s theme, “The Birth of Space Commerce”. Visitors to the city are welcome to attend. The Section also launched a handsome newsletter this Fall –NEXUS –edited by Owen Davies, senior editor at OMNI magazine. For more information about Section activities, contact William Good, Chairman, N.Y. Section, AIAA, 1290 Ave. of the Americas, New York, NY 10104.